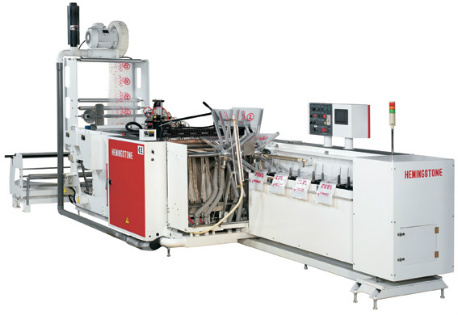 Karlville Development Group, a leading manufacturer of shrink sleeve application and shrink sleeve converting equipment has become exclusive distributors of Hemingstone- Bag Making Machines in the USA and Canada Territory. The wicketing conveyor ensures precise hole alignement and stacking on the pins. Micrometer calibrated seal bar adjustments control seal bar penetration, resulting in uniform bag seals. Each indexing station is equipped with stacking pins that can be adjusted to accommodate various wicketed sizes. The low idler rollers and pivoting dancer arm minimize web bounce and maintain precise web tension. For more information about our bag making solution please Contact Us. You may want to check also our Pouch Making Solutions.